Business Loop I-90 overlaps with U.S. 14 & 16 along 2nd Street through the Gillette city center. The business route separates from I-90 at the diamond interchange (Exit 124) with Wyoming 50 (Skyline Drive) in west Gillette. Skyline Drive in turn links the freeway with adjacent U.S. 14 & 16 and Wyoming 59 to the north. Wyoming 59 accompanies the three routes east through Downtown to Douglas Highway south. Business Loop I-90 ends where U.S. 14 & 16 join I-90 east to Moorcroft at Exit 128.
Business Loop I-90, U.S. 14-16 and WYO 59 shield assembly west of Downtown Gillette, Wyoming. Photo taken by Joe Kohler (2000). 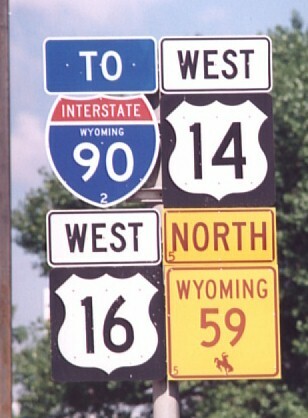 Older state highway shields in Wyoming used brown lettering and numbering instead of black. Over time these were phased out. WYO 50 travels 51.3 miles north from Wyoming 387 to U.S. 14-16 & WYO 59 in Douglas. A diamond interchange joins the state highway with I-90 where Business Loop I-90 begins in west Gillette. Photo taken 08/04/16. Heading west from Gillette, Interstate 90 traverses a sparsely populated area to Buffalo. Gillette offers the last motorists services before a 66-mile lack of them westbound. Photo taken 08/04/16. WYO 50 ends at the unmarked turn of Business Loop I-90 east onto U.S. 14-16 & WYO 59 (2nd Street). Photo taken 08/04/16. Second photo taken 08/15/14. U.S. 14 & 16 combine with Interstate 90 leading east from the folded diamond interchange at the Business Loop I-90 east end in Gillette. Photo taken 09/01/04. Business Loop I-90 west begins at a folded diamond interchange with U.S. 14-16 in east Gillette. Photo taken 08/15/14. The first confirming marker for Business Loop I-90 westbound along U.S. 14-16 (2nd Street). Photo taken 08/15/14. Stanley Avenue south to parallel 4th Street connects Business Loop I-90 & U.S. 14-16 (2nd Street) with the forthcoming Gurley Avenue overpass. Photo taken 08/15/14. Gurley Avenue spans high above both 2nd Street and the adjacent BNSF Railroad tracks north to suburban areas of north Gillette. Photo taken 08/15/14. Westbound Business Loop I-90 & U.S. 14-16 approach Wyoming 59 (Douglas Highway). Wyoming 59 travels south to Reno Junction, Wright, Bill and Douglas. Photo taken 08/15/14. Wyoming 59 is the best route to southeastern Wyoming and the Front Range of Colorado from Gillette. The nearly 172-mile long highway ends at I-25. Photo taken 08/15/14. The previous overhead sign bridge at the intersection of Business Loop I-90 & U.S. 14-16 (2nd Street) west and Wyoming 59 (Douglas Highway) south. Photo taken 09/01/04. Diverging from the adjacent BNSF Railroad line, 2nd Street kinks west to match the Gillette street grid ahead of Brooks Avenue. Brooks Avenue crosses the parallel railroad line north to Warlow Drive at McManamen Park. Photo taken 08/15/14. Wyoming 59 merges with Business Loop I-90 & U.S. 14-16 west through Downtown Gillette. This confirming shield assembly for the overlap stands at Carey Avenue. Photo taken 08/15/14. Business Loop I-90 intersects Gillette Avenue in the heart of Downtown Gillette. Photo taken 08/15/14. Advancing two blocks west from Gillette Avenue, the ensuing reassurance shields switch Business Loop I-90 for I-90 as 2nd Street leaves Downtown Gillette. Photo taken 08/15/14. 4-J road stems south from 1st Street nearby to extend across the height of Gillette to Gillette College and the suburban outskirts along Southern Drive. Photo taken 08/15/14. Business Loop I-90, U.S. 14-16 west & WYO 59 north pass by the Campbell County Rockpile Museum at these shield markers across from Stocktail Avenue. Photo taken 08/15/14. Burma Road represents the next crossing of the nearby BNSF Railroad line as it leads north from 2nd Street to Northwest Park. South from Business Loop I-90, Burma Road spans I-90 to subdivisions near Lakeway Road. Photo taken 08/15/14. U.S. 14 & 16 curve northwest ahead of WYO 50 (Skyline Drive) south to Interstate 90. Photo taken 08/15/14. Business Loop I-90 combines with WYO 50 (Skyline Drive) south to link back with I-90. Photo taken 08/15/14. WYO 51 commences a 51.3 mile route south to WYO 387 from U.S. 14-16 & WYO 59 in west Gillette. WYO 59 remains paired with U.S. 14 & 16 for another 7.1 miles. Beyond their partition, U.S. 14-16 continues west to Ucross while Wyoming 59 turns northeasterly toward Broadus, Montana. Photo taken 08/15/14. I-90 guide sign posted at the split with Business Loop I-90 on U.S. 14-16 west & WYO 59 north. Photo taken 08/15/14. A lone confirming marker stands for WYO 50 south of the Business Loop I-90 westbound turn from U.S. 14-16 & WYO 59 (2nd Street). Photo taken 08/04/16. Business Loop I-90 concludes at the westbound on-ramp for I-90 to Buffalo, Sheridan and Billings, Montana. Photo taken 08/04/16. I-90 loops around the south side of Gillette from WYO 50 (Skyline Drive) back to the east end of Business Loop I-90. Photo taken 08/04/16.